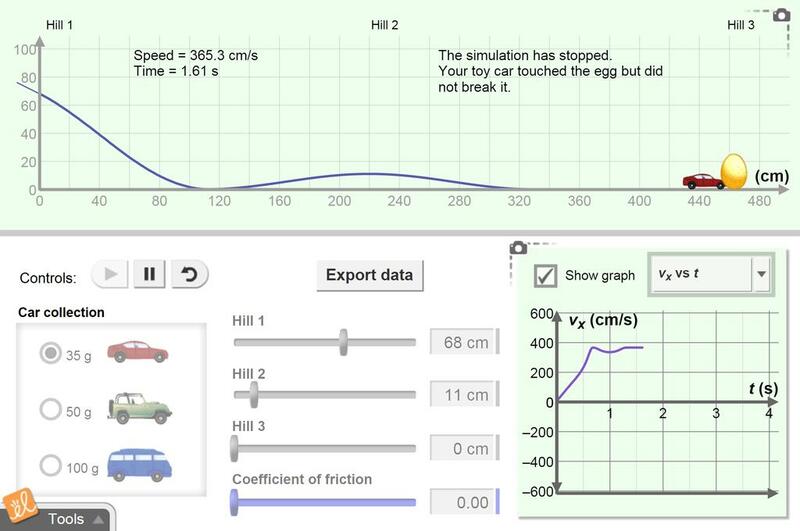 Observe the impact of changing friction on the distance and speed of the car. During whole class instruction, I provide the students with a seat work sheet. They use that document to... (more) make predictions, collect and analyze data, and write conclusions. The Gizmo's Student Exploration Guide (pages 1-3 only) is the basis of my lesson presentation. The Science of Car Crashes - 5E lesson plan complete with 5E lesson plan, hands on activity, close readin... (more)g activity, Gizmo, and emphasis on ELA common core integration. Kids love to break the the egg. It makes learning the material more fun. great gizmo. the students loved it. Great for working with conservation of energy and the students love playing with this gizmo. Kids love rollercoasters so using them in basic physics skills proved successful for my students. Excellent pre-lab activity if you have the students work on building their own roller coaster!